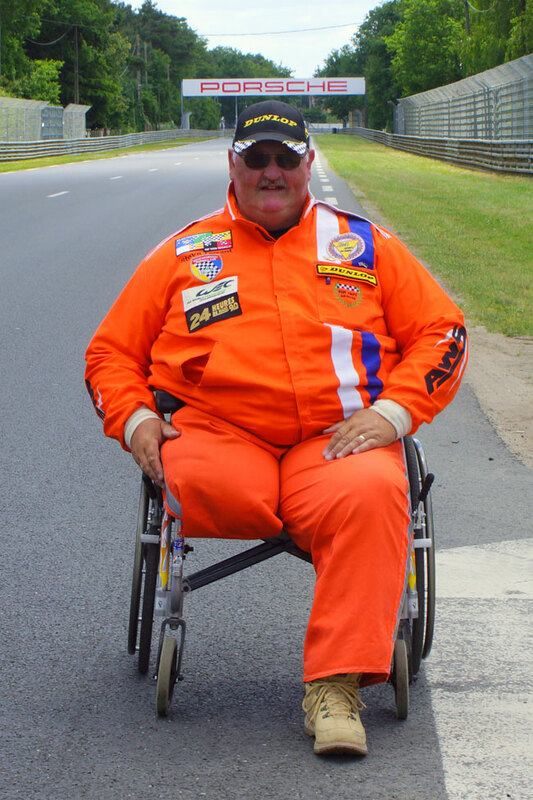 Blue Badge Mobility Insurance are proud to sponsor Steve Tarrant, a Motorsport marshal, celebrating 25 years as a marshal in March this year. Steve had been a marshal for 10 years when, in June 2000, he was working at the Goodwood Festival of Speed. He was stood on the finish line, chequered flag in hand, when the driver of a 1969 Formula 1 car lost control and crashed, hitting Steve and another marshal Andy Carpenter. The driver died at the scene and the other marshal died later in hospital. Steve suffered multiple injuries including the loss of his right leg. Incredibly, after 2 years spent recovering and gradually getting himself back to the racetrack, Steve began to Marshal again in 2002. Alongside his marshalling Steve also worked as an IT Support Technician, a job he returned to 1 year after his accident. In keeping with his ‘Not seen the last of me’ attitude Steve also does voluntary work and fundraising, the highlight of which was being involved in the London 2012 Olympics and Paralympics.In 2010 Steve responded to the Olympics volunteers appeal, and was thrilled to be selected as a medal bearer, the only one in a wheelchair. Steve presented medals at the sailing regattas in Weymouth and was also active in the Olympics PR, doing radio and newspaper interviews. This led to Steve receiving a Big Society Award on behalf of his fellow games makers from David Cameron and attending the BBC SPOTY awards. Following his involvement with the sailing Steve now regularly volunteers at the National Sailing Academy in Weymouth. 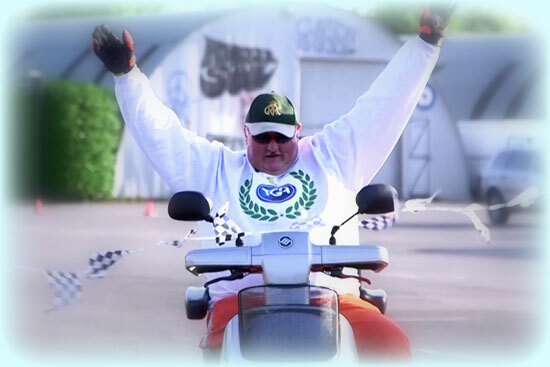 More recently Steve completed 2 world record attempts for the longest distance travelled on a Mobility Scooter in 24 hours, and in doing so has raised money for the Royal British Legion, Accessible Motorsports and Macmillan Cancer Support. Looking forward, Steve continues to travel with his Estonian wife Sirje and will be marshalling at Goodwood’s Festival of Speed and Revival meetings, and the Le Mans 24 hours, once again. He’s also looking to promote safe Mobility Scooter use, becoming involved in training centres etc. as well as working with the Disabled Ramblers Association to assist with making rambling more accessible. We’ll continue to support Steve throughout the year and bring you updates on what he’s up to.